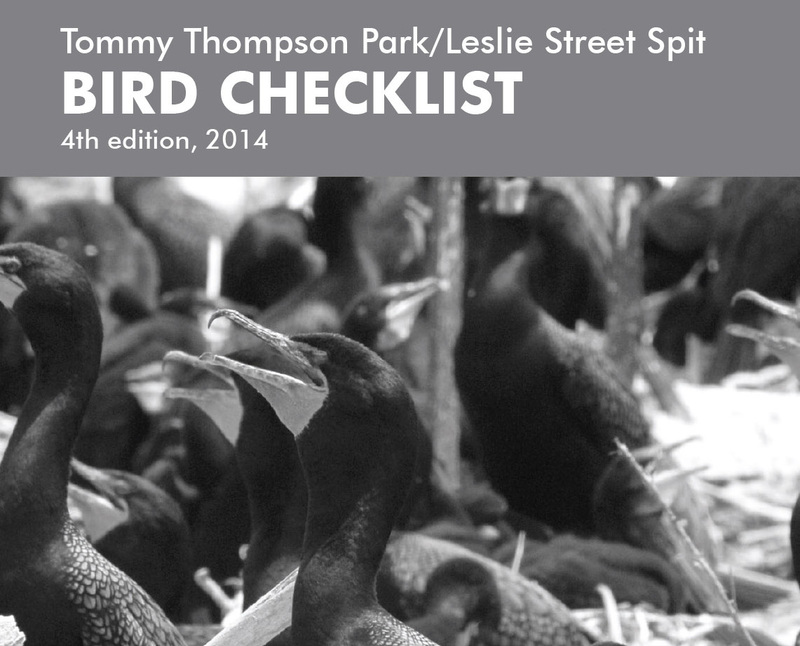 This checklist is made possible through the support of private donors and Friends of the Spit. Bird watching is a year-round activity at Tommy Thompson Park. Thousands of birds of more than a hundred different species pass through during spring and fall migration; breeding occurs during the summer, while winter brings waterfowl and owls. Our birder’s checklist, now in its fourth edition, includes all 316 species that have been recorded at the Park. Bird watchers are reminded to stay on designated trails and to never disturb wildlife, particularly roosting owls –- do not approach and never use a camera flash when photographing them. Sightings of birds that are regionally or provincially rare should be documented and the information submitted to the Ontario Bird Records Committee (ORBC), care of the Tommy Thompson Park Bird Research Station and/or Friends of the Spit. Where is Tommy Thompson Park located? Tommy Thompson Park (TTP) is located at the base of Leslie Street where it meets Unwin Avenue, south of Lakeshore Boulevard East. The park is open all holidays except Christmas Day, Boxing Day and New Year’s Day. Why can't I go in during the week? The park is not open during the week because it is an active construction site with a steady flow of trucks bringing in more fill. As a construction site it presents many dangers to the public and is therefore closed during construction operations for safety reasons. The construction site property is owned by the Ministry of Natural Resources and Forestry and is leased and operated by PortsToronto. When does the dumping take place? Lakefill operations run year long, Monday through Friday. For more information please visit PortsToronto. Free parking is available in the Tommy Thompson Park lot located immediately southwest of the entrance gate. Street parking is also available on Leslie Street and Unwin Avenue. BUS: The 83 Jones Southbound bus will take you to Commissioner Street and Leslie Street. From there, it’s a short walk to the park entrance. The 83 Jones bus runs Monday through Saturday with limited service. There is no bus on Sundays or holidays. STREETCAR: Take the 501 Queen streetcar and hop off at Leslie St. Walk south on Leslie to reach the park entrance. To plan your trip, visit the TTC online. Tommy Thompson Park currently has limited amenities. There are portable washrooms available for use at the entrance, the Staff Booth, Embayment D and Peninsula C, and offline toilets at the Outdoor Classroom. A first aid kit is available at the Staff Booth in case of emergency, and the staff have a mobile phone. Is Tommy Thompson Park wheelchair accessible? Yes. The main roads of the park are fully paved and wheelchair accessible. All portable toilets and the offline washrooms are also accessible. Why is it called the "Leslie Street Spit"? The “Spit” has actually had several names over the course of its existence. When the Toronto Harbour Commission (now PortsToronto) launched the project in 1959 as a lake-filling operation for port-related facilities, it was called the Outer Harbour Eastern Headland. In the early 1970s, when it was determined that port-related facilities were no longer needed, Toronto and Region Conservation (TRCA) assumed responsibility for the preparation of a master plan and management strategy. At the time, it was envisioned that the Spit would become a marine recreation park, to be known as Aquatic Park. By the early 1980s site conditions at the park had changed significantly, and a new vision for the Spit emerged: an “urban wilderness”. In 1985, the Spit was officially named Tommy Thompson Park to honour Toronto’s former Parks Commissioner. The name “Leslie Street Spit” was coined by local residents and remains the unofficial popular name. So what is a “spit” anyway? Simply put, it’s the geographic term for a type of landform created by the movement and deposition of sediment. Technically, Tommy Thompson Park is not really a spit at all, since it wasn’t naturally formed, but was constructed with landfill material (such as bricks and cement rubble); the term “peninsula” might be more strictly accurate. The entire Spit is approximately 5 km long from the entrance to the lighthouse. It is over 500 hectares in size. Toronto and Region Conservation currently owns and manages approximately 260 hectares as parkland. The remainder of the land is owned by the Ministry of Natural Resources and Forestry; it is leased by PortsToronto and operated as a construction site. How long will it take me to walk or bike the Park? Since everyone walks or cycles at different speeds, and many visitors may want to stop frequently to investigate and enjoy TTP’s natural wonders, it’s hard to say definitively how long it will take you get from the entrance to the lighthouse at the end of the park. If we assume an average walking speed of 4 km/h with no stops, it will take approximately 2.5 hours to walk to the lighthouse and back. But you should probably factor in extra time for breaks, and plan on an extended pause when you reach the lighthouse to admire the Lake Ontario vista. Why aren't dogs allowed at the park? Because Tommy Thompson Park is a significant wildlife, there is a strict no dogs/no pets policy in place. No exceptions. TTP is managed as an “urban wilderness,” and one of the objectives is to provide critical habitat areas for wildlife along the waterfront. The park has hosted more than 300 recorded species of birds, many of which use it as a summer breeding area. Several of these species are ground-nesting birds, whose nests would be at risk if dogs were permitted in the park. In addition to ground-nesting birds, fledglings from tree-nesting species would also be at risk as they practice their first flights or perch close to the ground. Tommy Thompson is also home to mammals that may endanger — or be endangered by — domestic dogs. Coyotes have successfully denned in the park for many years, and are observed on a regular basis. Coyote-dog interactions are rare, but can happen. Coyotes in other Toronto-area parks have been known to approach and stalk dogs both on-leash and off-leash. Many small mammals such as rabbits, voles, groundhogs, beavers and muskrats also breed at the park. These species are common targets of domestic dogs. The decision to prohibit dogs in the park was not made arbitrarily. During the master planning process for Tommy Thompson Park, the Natural Areas Committee — which consisted of naturalists, stakeholders, and members of the general public — studied the issue carefully and concluded that it would be in the best interest of the park’s wildlife to not allow pets. Is there bird watching at Tommy Thompson Park? Yes! Tommy Thompson Park is one of the premier bird watching spots in the GTA. TTP was declared an Important Bird Area (IBA) in 2000, due in part to the globally significant colonial waterbird populations that nest here. The park is also stopover and concentration point for many species of migratory birds. More than 300 species of birds have been sighted at TTP, and approximately 55 species have nested here. LEARN MORE. What are the best areas in the park for bird watching? There are many areas in Tommy Thompson Park where you can watch birds without disturbing them. Right from the park entrance many songbirds — especially red-wing blackbirds — can be seen and heard easily in the spring. Eastern kingbirds and swallows of various species are a common sight along the roads. The Cell One Wetland Creation Project has a viewing platform where, with binoculars, various species of marsh birds can be seen. In addition, tree swallows and bank swallows are usually present in spring and summer. Cells Two and Three, as well as the waters off the lake and Outer Harbour, are popular spots in the winter to view waterfowl. During migration periods, significant numbers of shorebirds may stop at the park and can be seen foraging in the exposed mudflats and shallow waters of Cell One, the Embayments and the Shorebird Wetland. The Embayment D viewing platform allows an easy view of the common tern reef raft, as well as excellent views of the entire embayment, where shorebirds and wading birds such as great blue herons and various waterfowl species are often seen. Triangle Pond, one of the first habitat creation projects at the park, is also popular spot for waterfowl, wading birds and songbirds. You might even see a beaver or a muskrat! Peninsula D is one of the best areas to look for migratory songbirds and is the location of the Tommy Thompson Park Bird Research Station. A number number of ground-nesting bird species make the park their home. Please stay on marked paths to minimize disturbance to these birds while they are nesting. When is best time to watch bird migrations? Bird watching during spring and fall migration is an exciting time. Bird enthusiasts have the opportunity to see species that are not normally present in the GTA for extended periods of time. Most are just passing through and use TTP as a place to rest and forage to build up their energy reserves for the balance of their journey. Periods of good weather followed by locally disturbed weather can mean that migrants will land and stay for an extended period. Once the weather improves, they will move on and the next batch of migrants will move through. Depending on environmental conditions, the third week of May is usually a good time to see spring migrants; mid-September is a good time to see fall migrants. Yes! Interpretive tours are offered by Toronto and Region Conservation (TRCA) during special events like our Spring Bird Festival. For more information on upcoming special events, please check out our calendar. Some other organizations, such as the Toronto Field Naturalists and the Toronto Ornithological Club, also offer tours to more specialized audiences. I'm a teacher. What kinds of educational programs do you offer for students? Toronto and Region Conservation (TRCA) runs a number of educational programs at Tommy Thompson Park. The bird studies program Winged Migration is specifically geared toward the Life Systems curriculum for grades 4, 6 and 7. Watershed on Wheels (WOW) delivers a number of programs at TTP, such as the Aquatic Plants Program (APP). The APP gives students hands-on experience growing and caring for aquatic plants before planting them at a local wetland; at Tommy Thompson Park, the site is usually the Cell One Wetland Creation project. The APP meets curriculum links for several grades. Do I need authorization for photography and filming?